Esterháza is a palace in Fertőd, Hungary, built by Prince Nikolaus Esterházy. Sometimes called the "Hungarian Versailles", it is Hungary's grandest Rococo edifice. Esterháza was not the primary or ancestral home of the Esterházy family; that was Schloss Esterházy, a palace nearby (40 kilometers (25 mi)), in Eisenstadt. Miklós Esterházy began his plans for a new palace not long after he became reigning prince in 1762 on the death of his brother Paul Anton. Before this time, Nikolaus was accustomed to spending much of his time at a hunting lodge called Süttör, built in the same location around 1720 with a design by Anton Erhard Martinelli. The hunting lodge was the nucleus around which Esterháza was built. The first architect to work on the project was Johann Ferdinand Mödlhammer, succeeded in 1765 by Melchior Hefele. While the palace is often compared to Versailles, which the Prince had visited in 1764 when he visited Paris, H. C. Robbins Landon claims that a more direct influence can be found in "Austrian prototypes, particularly Schönbrunn palace in Vienna." The palace cost the Prince the sum of 13 million Austro-Hungarian gulden, a figure that Robbins Landon terms "astronomical". Eszterháza was first inhabited in 1766, but construction continued for many years. The opera house was completed in 1768 (the first performance was of Joseph Haydn's opera Lo speziale), the marionette theater in 1773. The fountain in front of the palace was not completed until 1784, at which point the Prince considered his project complete. 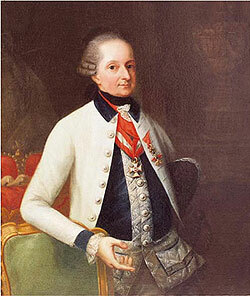 Nikolaus Esterházy died in 1790. Neither his son Anton, who inherited the Esterházy lands, nor any of his later successors had any interest in living in the isolated palace. The palace was built near the south shore of the Neusiedler See, on swampy land, a health hazard at the time. Robbins Landon notes that "it was a particularly eccentric idea on the part of Prince Nicolaus to choose it as the site for a large castle. Possibly the castle's existence was to prove 'mind over matter'". The palace has 126 rooms. Of particular note is the Banquet Room which has on its ceiling a painting of Apollo in his Chariot. The large library holds almost 22,000 volumes and is graced with the letter 'E', standing for the family surname. The largest room is the grotto-like Sala Terrana which was inspired by the then fashionable Italianate style. On the ceiling are dancing Angels who hold wreaths of flowers in the shape of an 'E'. From 1766 to 1790, the estate was the home of the celebrated composer Joseph Haydn, where he lived in a four-room flat in a large two-storey building housing servants' quarters, separate from the palace. Haydn wrote the majority of his symphonies for the Prince's orchestra. Eszterháza also had two opera houses, the main theatre seating 400 (destroyed by fire in 1779) and a marionette theatre; Haydn conducted his own and others' operas, often with more than a hundred performances per year. The palace was geographically isolated, a factor which led to loneliness and tedium among the musicians. This is seen in some of Haydn's letters, as well as in the famous tale of the Farewell Symphony. ^ Cuthbert Hadden, James (1902). Haydn. Cambridge University Press. p. 58. ISBN 978-1-108-01987-3. ^ At Madach sétány 1, now a music museum (Muzsikaház) and gallery. ^ Wyn Jones D, Ed. The Haydn Oxford Composer Companion. Oxford University Press, Oxford, 2002. Webster, James (2001) "Joseph Haydn", article in The New Grove Dictionary of Music and Musicians. Wikimedia Commons has media related to Esterházy-kastély.